The River Spey is one of the largest rivers in Scotland, having a total catchment of 3008km2. The river network extends to some 36400km2 of which the main stem comprises 157km. 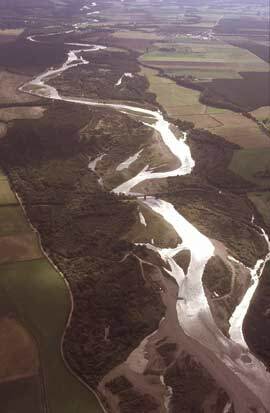 From its source, Loch Spey (350m above sea level in the Monadhliath Mountains), the river travels in a northeasterly direction to discharge into the Moray Firth at Tugnet. The Spey is an alpine river, with melting snow supplementing flow well into spring. 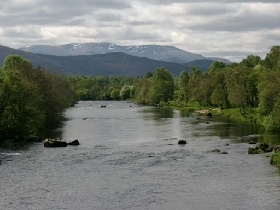 In comparison with other UK rivers the Spey is ranked eighth in terms of mean annual flow, seventh in terms of its length and ninth in terms of catchment area. The main river is also relatively free from obstructions. In common with many Highland rivers, the waters are low in nutrients and, with a lack of major industrial developments within the catchment, the Spey has remained fairly free of pollution. Indeed the catchment of the Spey is considered to be almost 'pristine'. 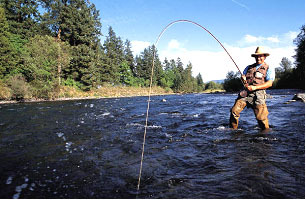 The Spey is similar to many Scottish Highland rivers and supports only a limited number of fish species. These include: Atlantic salmon; trout as migratory sea trout and resident brown trout; European eel; Arctic char; pike; minnow three-spined stickleback and flounder. In recent years a number of local lochs have been stocked with rainbow trout, which have subsequently found routes into the Spey itself. However, there is no evidence that they have established a breeding population. Local 'Gillies' will gladly guide you along the Spey to the best spots (for a fee!! - of course) and fishing is allowed with the purchase of day tickets and local tackle hire. In particular, please note that there is no salmon or sea trout fishing on Sundays anywhere in Scotland. The Salmon & sea trout seasons for the River Spey run from the 11th of February through to the 30th of September. For more information on fishing in the Scottish Highlands please visit http://fish.visitscotland.com/ .This web site has alot of good information on fishing regulations and codes of practice when using the river. It also has current river condition information as well as catch information. 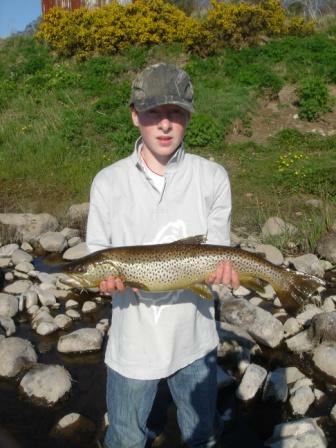 Young Robert Buchan from Grantown On Spey, Age 15 with one of his may catches for the season. This specimen a typical Brownie that can give very good sport in some of the better known pools on the assocition water weighed at 4lb.1oz Roberts knowledge of the river and fishing skills helped him secure this fish after a 20 Minutes. talk about beginers luck, this is what he got 5 cast later. he handed the rod back to the guest. Salmon caught on a fly. Sandy, Val, Pearly and "Oor Wully"